Not your typical Pink Rose flower, the Verdi Pink rose is a lightly white washed blossom that radiates its pink hue. A pinker bud than white, this duo dancing floret is perfect to be paired with solid colors to create variance or to blend into other colors. With such multi-uses this can stand on its own or be added at Valentine's Day Events, Weddings, or any event that traditionally uses red, white, or both. As a corsage it is an excellent piece to be worn with any outfit at any event. In centerpieces these flowers are exceptional. It is a gem of the natural world, that is why we do our very best to make sure to protect Mother Nature. We use only green methods to grow our products to guarantee Mother Nature will be able to grow her precious blossoms forever. Our facilities are not only green but also on the cutting edge of modern. Our products grow throughout the year thanks to Colombia's sunny year long days. 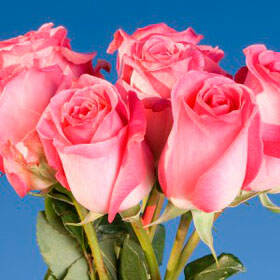 The Verdi Pink Rose flower is just one of many we have available all year long. All of your orders will be delivered to you by FedEx and if you are a continental USA customer your shipping will be free of charge.